Game designer Scott Cawthon gave the big reveal last week when he announced “Five Nights at Freddy’s 4: The Final Chapter” with one terrifying teaser shortly followed by another. 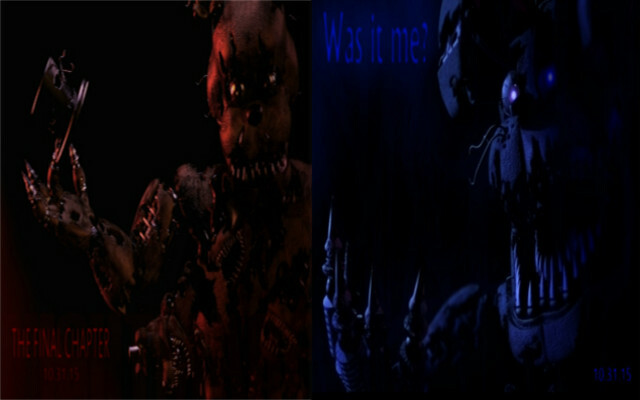 Cawthon’s first image is of a twisted, deranged Freddy Fazbear being dubbed “Nightmare Freddy” by fans of the franchise due to the word “nightmare” seen in the reddish background when the image is brightened. Nightmare Freddy features bits of exposed endoskeleton (similar to Spring Trap in Five Nights at Freddy’s 3) followed by sharp teeth and large claws. His eyes are fixated on the “camera” in a chilling glare. The creepiest asset Nightmare Freddy has is his three mini Freddy’s crawling out of his torso. It gets more terrifying with Nightmare Bonnie (which can currently be seen at Cawthon’s website). The hulking animatronic has sharklike rows of razor sharp teeth that make up a chilling smile and claws to boot. Nightmare Bonnie’s endoskeleton is also exposed in some places, but not nearly as much as Nightmare Freddy. Nightmare Bonnie’s eyes have an eerie purple glow to them rather than the solid, more realistic look of Nightmare Freddy’s. The word “nightmare” in Nightmare Bonnie’s teaser is much more prevalent in the blue background. In this teaser however; Cawthon has left us a message. With all the lore and theories pertaining to the franchise it’s very likely that this is referencing the purple man seen throughout the series (red and blue do make purple, after all). But there is also the possibility that this is referencing the biggest mystery in the series: what caused the bite of ’87? If you’re new to Five Nights, the “Bite of ’87” is an incident where an animatronic bit someone during the day, removing part of their frontal lobe. Cawthon has placed multiple eights and sevens in the source codes of the teasers. This is no coincidence. Also judging from the looks of these new monstrosities, it would take little to no effort for either creature to take out a chunk of your brain. While the game is set for release this Halloween, Cawthon has already begun to flood the internet with theories and speculation due to his innate way of messing with our heads and has only begun to scratch the surface. Will we be seeing more nightmare versions of the other animatronics? What is Cawthon referencing? What does it all mean? Knowing Cawthon, we’ll all find out in due time.